Grandeur like you have never seen before capsizes your imagination and takes you on a whimsical journey in this 16 acre sprawling estate! Residing in the premiere residential community of Holly Creek Estates, this exquisite property offers a quiet country setting of rolling landscape close to city convenience. A one of a kind ball room replicated from Napoleaon's apartment in Louvre is adorned with solid marble pillars, Italian marble floors, gold plated Sherle Wagner bath fixtures, and wall coverings by Scalamandre and Braunschweig. Sconces in the library and balcony are hailed by St. Loius and Bacarrat of France. The historical based ceiling painting by Russel Erwin is by Tiepolo "Giving of the Rosary". The original painting can be found on the ceiling of the Catholic Church in Venice on Grand Canal. The large paintings "Oath of Socrates", and "Coronation of Josephine", are copies of David which hang in the Louvre. Handmade walnut floors invite you in to be dazzled by sweeping staircases and the finest of chandeliers while casting your eye to the refreshing pool and elegant lifestyle. 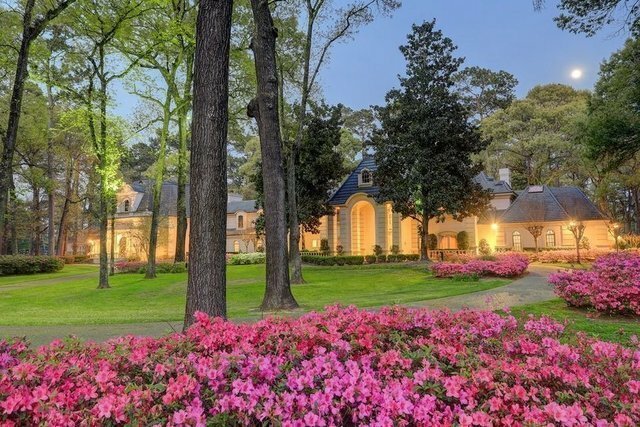 Fish in your own pond, play tennis in the private court, and watch the horses graze outside of the sizable barn. Elegant master suite with bath featuring breccia permice marble also well known in the Trump Tower, in addition to generously sized secondary en-suites. Expansive apartment quarters and separate guest home ensure visitors plenty of their own space! This just begins to scratch the surface of this luxury masterpiece of a property.